The Corona Sunset Festival was one we had been looking forward to for a while. 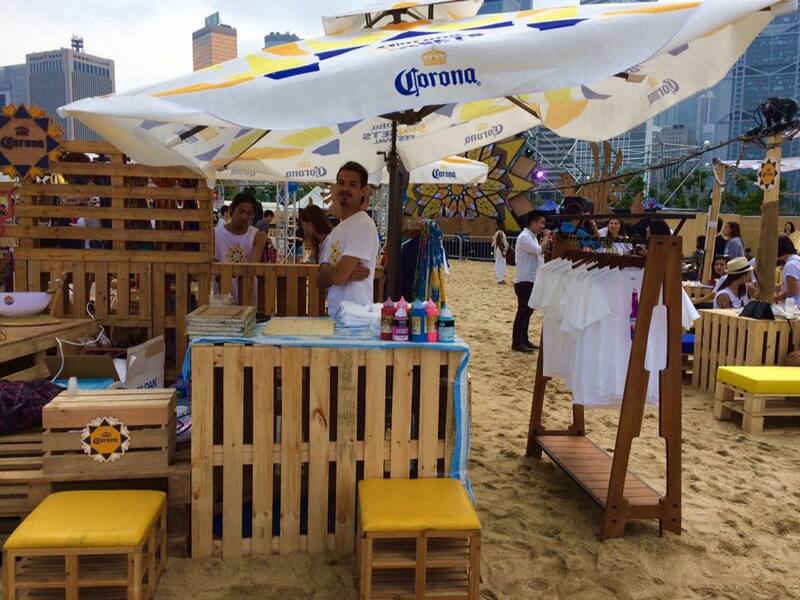 Sun, sand, Coronas and screen printing- just has a nice ring to it, doesn’t it? Well the event definitely didn’t disappoint. It was an awesome set up on the Central harbour front that brought the beach to its doorstep. The attention to detail was amazing, and they managed to capture feel of a ‘beer and beach lifestyle’ festival to a T.
This kind of ‘al fresco’ set up is one we have enjoyed and have had success working with in the past- simple and authentic with a laid back spin to it. We were commissioned with 200 pre-printed t-shirts and 50 for on-site live printing. It was a good order for us, but one that posed a bit of a hurdle that we thought worth reflecting on. For most events, we are brought in for live printing and following our philosophy of inclusion and customer interaction, it’s all about getting them involved and hopefully printing their own t-shirts whenever possible. While this has been a hit with customers in the past, it created a lopsided sale trend with the pre-printed tees being overshadowed by the idea of customising and printing your own. It was a tough spot to be in. Without shutting down the live printing, it became increasingly hard to drive people toward the pre-printed selection, even with quite a significant price difference between the two, especially after the hype of live printing had picked up. We were fortunate however, in that we were commissioned to print each of the different pre-ordered t-shirts with a distinctive colour blend, resulting in 200 still unique pieces, in a range of different sizes – giving us a valuable selling point and much needed leg to stand on. With a switch in display emphasis, a re-evaluated price difference and a tweaked ‘door in the face’ sales technique (offering the more expensive option before highlighting and driving attention to the cheaper one), we found we were able to boost the sales of the pre-printed pieces- you’ll be surprised the effect the word ‘only’ has on a customer’s decisions making process when cost is a central factor e.g. to print your own is $150, but over here, the pre-printed selection is only $80. It was an unusual feeling to divert attention from the very craft and service that has brought us so much success and earned our reputation at other events in the past. Ultimately though, it provided a valuable development experience that took us out of our live printing comfort zone and highlighted the need to balance, and compliment both our service, as well as our products at future events. Going forward, we definitely agreed it would be prudent to separate the two items, display and then market them accordingly. 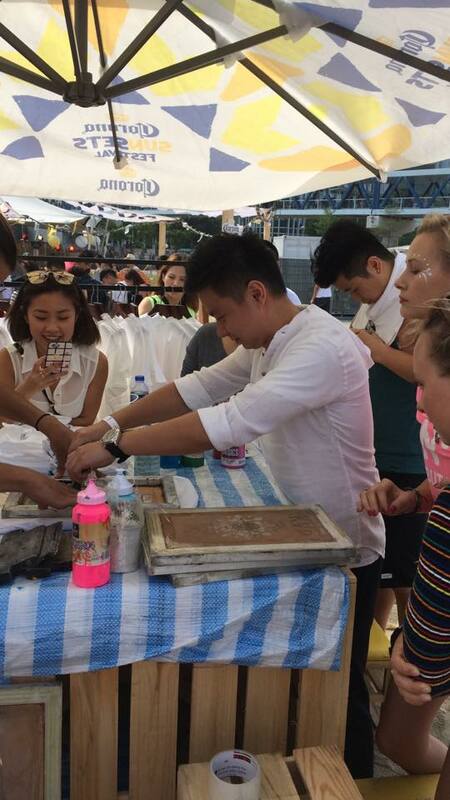 Keeping the pre-printed shirts exhibited and sold as merchandise, and leaving the live printing to its own boutique booth will support their individual qualities without compromising and overwhelming each other’s sales. Overall, it was an amazing festival- the atmosphere and energy from everyone involved was really in line with events that we thrive at and are passionate about. We look forward to another great time next year- so keep an eye out for the Corona Sunset Festival!